The Magic Millions Sale at the Gold Coast has begun with four yearlings fetching $1 million or more. Four yearlings have fetched $1 million or more on the first day of the Magic Millions sale at the Gold Coast headed by a Redoute’s Choice-Purely Spectacular colt. Offered by Bhima Thoroughbreds, the colt was bought by Aquis Farm and Phoenix Thoroughbreds for $1.6 million. “We loved the horse,” Aquis Farm chief executive Shane McGrath said. “He’s by Redoute’s and he’s the sire of sires here in Australia and he’s a brother to a proper Group One winner (Stratum Star). “We loved him. He vetted out clean and he’s going to be an exciting horse for our partnership. Trainer Chris Waller’s bloodstock agent Guy Mulcaster, the man responsible for finding Winx at the Magic Millions, went to $1.3 million for a colt by I Am Invincible colt from Tai Tai Tess, a full brother to last year’s sale topper. International bloodstock agent Marie Yoshida of Asian Bloodstock Services paid $1 million to secure Peggy Jean’s Medaglia d’Oro colt from Widden Stud and he will be trained by Peter and Paul Snowden. The top priced filly on Wednesday was the I Am Invincible-Rose of Choice youngster bought by Yulong Investments who paid $1 million. 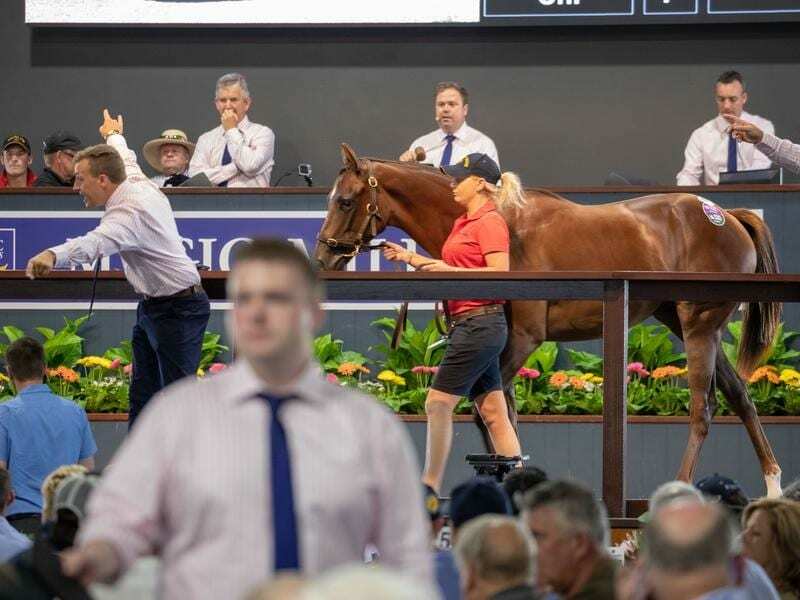 The China Horse Club and Newgate Bloodstock partnership ended the day as the leading buyer, outlaying $3.46 million for eight lots while Redoute’s Choice was leading sire by average for three or more lots sold at $690,000. The sale continues on Thursday.